The division of the landscape by a river (with an accompanying bridge) is a typical, recurring topographical feature of the Münsterland region. This special situation provided the basic framework for the sculpture Bolzplatz (Undeveloped Playground). Not far from the bridge, a soccer pitch with smaller dimensions (44 x22 meters) is installed on both sides of the river. One goal stands on either side of the river. On both sides, the field begins on a horizontal surface, but then descends with the slopes of the riverbank and disappears in the river, re-emerging on the other slope. The image of a soccer pitch displays numerous analogies to the landscape form described above: a soccer pitch marks a site held in common, but one divided into two halves by a middle line. The game’s objective is to reach the opponent’s goal (shore). Theoretically, a goal could be scored from one shore to the other, but who could run such a brilliantly-played through pass? The Undeveloped Playground gives the nearby bridge, which really does connect both shores, an additional function as shared spectators’ seating, from which the artwork (the course of play) can be viewed. 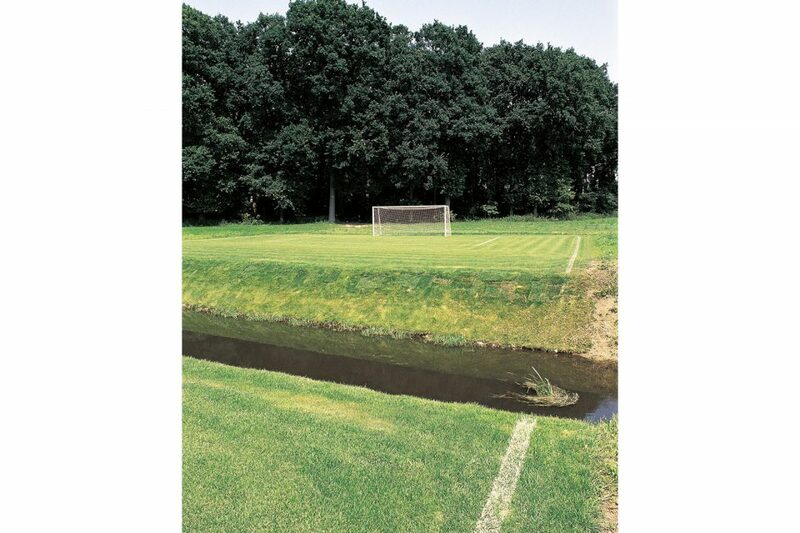 The divided soccer pitch points out in an absurd way the river’s incisive division of the landscape, but simultaneously also functions as an immaterial, imaginary “bridge“ connecting the two shores and defining them as belonging together.